Nu har den reviderade Norlin One Design regeln kommit, den är nu ute för omröstning. Som ni ser i stycket “From the President” så är det bara en omröstning om uppdatering av dom befintliga OD reglerna. Som ni också ser i den nya klassregeln så står den gamla formuleringen in överstruken röd text och den nya i röd text. Attached are letters from the President and Head of the Technical Committee. Please read these in conjunction with the attached rule document to have a clearer understanding of the process and history. Pursuant to the terms of the 2013 Constitution of the International 2.4mR Class Association notice is hereby given of the proposal from the Class Technical Committee to adopt the Norlin One Design Class Rules, as attached, in full replacement of those adopted at the 2013 AGM. Under the terms of the 2013 Constitution a 30 day discussion period was invoked which started on the 21st February 2014, and ended at midnight 23rd March 2014. Following this the Class Technical Committee looked at and took into account some of the concerns and proposed changes that were received. Attached to this notice is the final version of the Norlin One Design Class Rules as now proposed for adoption. This notice is given to all NCAs who should circulate their membership and form a YES/NO position for that NCA. Each NCA should then forward the YES/NO result to the Class Secretary by email on this address within the 15 day period starting from the date of this email. Answers received after the end of the 15 day period will have no validity in the voting procedure. The period for comments is finished as far as this vote is concerned but the EC and TC via the secretary are happy to receive comments in the future which may cause a further review of the rules on an ongoing basis. The date of this email is the 27th April 2014 and the period for receipt of YES/NO answers will end at midnight UK time on the 11th May 2014. The votes cast by each NCA will accord to the level for each NCA at the 2013 AGM. A simple casting of the votes to achieve a majority will decide whether the rules are adopted or not for immediate use. Hello all NCA’s and class members. Attached is a revised Norlin OD rule to be voted upon. Changes to the Norlin OD rule do not change the 2.4mR rule in any way. Norlin OD rule may be a sub set. The current (2013) Norlin OD rule is already in place. The vote is not whether these rules will exist or not it is about which version will be in place. This new version (2014) of the Norlin OD rule will replace the 2013 version if the vote is in favour of it. If the vote is no then the 2013 version will remain valid. The new version (2014) of the rule allows more flexibility for the sailors and is much clearer for interpretation. The new version (2014) has been developed using a wide scope of consultation with all parties within the 2.4mR class. The International 2.4mR class has the job of looking after the rules and changes but has no control over who uses these rules. Future changes to rules (2.4mR or Norlin OD) will be handled at the 2.4mR class AGM once a year. The IFDS World Championship event will be using the Norlin OD rules regardless of the outcome. The choice is between the version we have now (2013) or the new one (2014). I believe the new one to be a fairer version and in the interests of the sailors. I urge you to carefully consider the outcome and cast your vote via the NCA process. Här är en beskrivning om tillkomsten av OD, den är skriven av International 2.4mR Class Association’s tekniska kommitte. The driving thought for the group that likes One-Design (OD) is to grow the 2.4mR class. We have noticed that it is rare with stable and growing design classes. 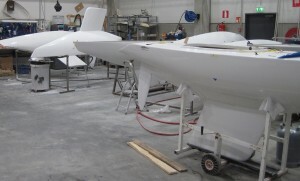 The reason is that most sailors prefer fun on the water compared to time in the work shop. They like to be able to buy competitive standard equipment from a producer or vendor. We have seen sailors drop off when the word has been that a handful of sailors have better equipment. Equipment that isn’t available for everyone. We have also seen how builders are reluctant investing in moulds and production capacity knowing that it may be outdated over a night. We have after one year of One Design already seen the number of interested builders increase. 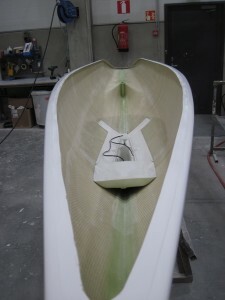 In a design class the control of boat selection and quality is entirely in the hands of the designer. The designer may decide to cease production any day. He may decide to switch to a different design or just stop because he has no interested builder. He may decide to change the production to low quality mass production. A design class has no control. In our class more than 95 % of the boats at all the world Championships has been Norlin Mark III. We think that a disturbance in the production or in the quality of those boats would hurt the class and we like to have some control. That is something the One Design agreement with Peter Norlin has given us. The 2.4mR is a fantastic boat for disabled sailing. After 2008 the 2.4mR was almost voted out of the Paralympics and one reason was the fact that it’s a design class. A design class has not been Olympic equipment since 1968 and it’s not likely to come back. That we can race our boats in the big world cup events like Miami and Kiel is only thanks to Paralympics and disabled sailing. The international growth of the class is also to a large extent a result of Paralympics. We think that disabled sailing contributes in many aspects to our class, and would not like to be without it. To support Paralympics and disabled sailing a One Design is a necessity. As we like the including culture of the 2.4, where young, old, man, woman, able bodied and disabled sail together we don’t like to exclude anyone. We have therefore suggested that all OD boats shall also be 2.4mR. It’s a requirement which means that every time we promote OD boats we promote 2.4mR sailing. It works in the same way that an advertisement for a small BMW also supports the BMW brand and sales of the larger versions. The one-design initiative has now a long history. The story we are now involved in started with an AGM decision 2006 to investigate possible routs forward. It was clear that an OD class would evolve one way or the other. 2007 the ODRC committee was elected and started their work developing rules and other necessary documents. The rule has seen many versions and phases since then and in 2011 the AGM decided that both the OD rule and the open rule should be administrated by the International 2.4mR association. Peter Norlin has been a committee member. Peter is the designer of the boat but also the person who constructed the 2.4mR rule and started that class in the 80-ties. Peter is the designer of many one-design classes as well as meter boats in several sizes, 2.4mR, 6mR, 8mR and 12mR, IOR racers…. Peter has one 2.4mR world championship gold medal, in his large collections of world championship titles from other classes. Rikard Bjurström, has been a committee member. He has one world championship gold medal in the 2.4mR class. He is a sail maker and spar developer and is used to work with class rules. 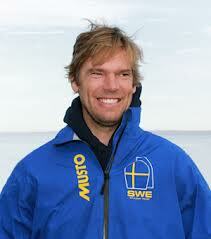 Rikard started sailing 2.4mR 1994 and has been the president of the Finnish 2.4mR association. Rikard has been a coach at 3 Paralympic games. Stellan Berlin has been a committee member. He has 7 world championship gold medals in the 2.4mR class and one world championship gold medal in 6mR. He has a Ph.D in fluid mechanics, is a sail maker and experience from many classes and is used to work with class rules. 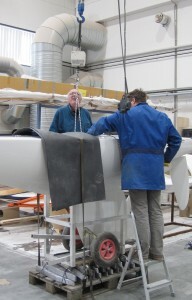 Stellan started sailing 2.4mR in 1998 and has been president of the Swedish 2.4mR association for 4 years. Stellan has also been a coach at 2 Paralympic games. Peter Wilson has been a committee member. Peter is an international active judge and has sailed the 2.4mR since 2001. He has been the president of the US 2.4mR association. Peter has experience from sailing 12mR in Americas Cup. When the International 2.4mR class decided to administer both classes and accepted the OD rule. The development of the rule was turned over to the technical committee of the class. Many 2.4mR enthusiast have during the long development period contributed with ideas and comments on the OD rule. This is very encouraging. Compared to other rule writers the committee has had one advantage. The boat, its performance and how the sailors like to use it, is very well established after 20 years of sailing. 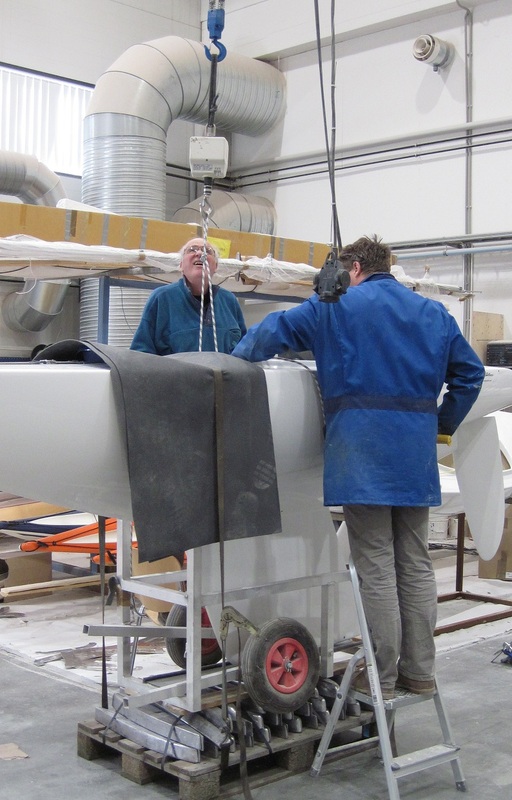 The difficulty has been the balance between a strict one-design, the need to make a large proportion of the existing boats fit in without major modifications and the need for the fun that sailors find in adapting their boat to their size, abilities and taste. Different to other OD classes we also want to consider the large fleet of disabled sailors, which clearly affect the OD rule and its strictness. There is no definition of one-design. Classes that are considered one-design differ a lot in permitted variations. There are examples of classes that give builders and sailors a considerate freedom in both hull shape and equipment, e.g. Star and Dragon. Yet other one-design classes as Laser or 49:er are very strict. There is no evidence that one approach would be more successful than the other. The “experts” seem to have different views about this. There have also been practical issues to consider. Is a certain material or equipment equally available to builders in all parts of the world? If a sailor breaks a mast or boom, is it reasonable to require that a specific spar shall be shipped from the other side of the globe. How will we find new builders if we stipulate every step in the production process? Remember, building 2.4mR equipment is not the most profitable business and our turnover does not match Laser or Star. An example of an often discussed matter that we had to decide on is the ballast weight. We have to set it to something that is reasonable to produce. New boats should be able to reach the maximum. We don’t like the majority of boats to carry heavy corrector weights. It would not be practical and would be take the development a step back. It’s good for the class that there is a drive to replace old boats with new ones. We set the maximum to 181 kg, which has worked well in the appendix K used for disabled sailing for several years. A minimum would definitely take some boats out of the class and we don’t see the point in that as we can’t imagine that they would ever have an advantage. Moreover, some sailors need to fit a lot of additional equipment on their boat, such as Peter boom, complex steering arrangements or something else. To meet the total weight they have to remove ballast. Why would we exclude them? If we like to push the producers, it can be done through the licence agreements. The present result is what the OD committee and technical committee after a lot of work and consideration has come to. Some details that seem simple at first sight tend to be more complex when you give it some consideration and put it in a larger context. We are sure a different groups of rule developers would in some cases have found a different balance. We have certainly missed some details. However, class rules are living and in the same way as the 2.4mR rules are continuously developing, so will the one-design rule evolve over time. We think that the current result is a major step forward compared to the old Appendix K, and it’s a good improvement compared to last years version. We will in the future continue to find parts that need adjustments and improvements. We hope that all the hard work we have invested will lead to more fun on the water for many more sailors in our class. The World Council shall, before the close of its 2006 meeting in Helsinki, appoint a qualified committee of five (5) class members (called the 2.4 one-design committee) to thoroughly investigate the opportunity to evolve the 2.4mR from a construction (development) class to a onedesign class. The committee will establish facts, assess the issues, and make a written recommendation, in concert with the Technical Committee, to the World Council within six months. 2. The World Council shall form a committee (The One-Design Rule Committee – ODRC), who will work in concert with the Technical Committee, ISAF and IFDS to develop a rule that will govern the 2.4 mR .one-design boat including its production. Develop a design based on the Norlin Mk III and secure exclusive Class rights to this design. Develop a one-design rule and the requirements for grandfathering existing boats. 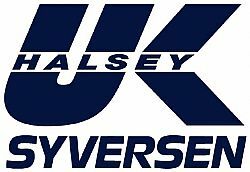 Working with IFDS, ensure that the rule has enough flexibility for the adaptive requirements of disabled sailors. Develop construction specifications, working in concert with current Norlin Mk III builders. Solicit input from the World Council on a going basis with a clearly defined process that enables the ODRC to pose questions, get answers and if needed conduct votes so as to move this project forward with consensus built along the way. Ascertain all key steps required to gain appropriate ISAF approvals (as needed) to complete this project by July 1, 2008. 3. The .One-Design. Rule Committee shall be chaired by Hakan Kellner with the following members: Stellan Berlin, Peter Norlin, Rikard Bjurstrom and Peter Wilson. The One Design Committee continue together to facilitate the ongoing talks with ISAF and the IFDS. Also to develop the forms and license procedures needed to implement the change. a. Continue on the path to await ISAF direction, and then prepare both building specifications and the OD Division rule according to ISAF preferences. b. Submit the final ODRC recommended rule to the World Council for final comments and approval before submission to ISAF. c. Recommend to IFDS that to help transition towards one design for their events, that they modify Section K in the Notice of Race with full permission from the Class to do so. The new Class President and EC will develop the plan for work to be done, which of course will include continuation of the ODRC work, the new Policy Manual (described above) and any proscribed changes for the constitution or class rules, and the proactive search for WC hosts for 2012 and 2013. De flesta av dagens aktiva 2.4 seglare har lockats till klassen av en inbiten 2.4 seglare en gång i tiden. Ofta blir man sedan fast i många år. Studera bara maratontabellen så ser Du detta klart. Det senaste året 2013 har antalet deltagare per regatta(rankingarna) glädjande ökat något, och de som är riktigt aktiva deltar i fler rankingseglingar. På SM i år var det fler båtar än på länge. Detta kan till del bero på att det är trevligt att träffas med bra boende, trevliga middagar och umgänge, gemensamma boendeformer och fina arrangemang. Det utländska deltagandet har ökat något vilket säkerligen kommer att öka ytterligare då samarbetet med Norge, Finland och Danmark är i ökande med arrangemang som Nordiskt Mästerskap som i år går i Gävle. Vi måste försöka öka antalet 2.4 seglare än mer och förbundet vill därför uppmana alla gamla inbitna rävar att rekrytera åtminstone EN ny seglare nästa år. De som lyckas med detta kommer att bli föremål för tacksamhet. Vår förbundsbåt är till för att lånas ut. Båten är åtgärdad och håller god kappseglingsklass. Får Du någon att nappa på rekryteringen finns möjlighet att låna båten, dels för träning, dels också för rankingsegling(ar). Programmet för nästa år ligger redan klart (se hemsidan) Vi börjar med sedvanlig träning och rank 1 i Tanum. Daniel Birgmark blir vår tränare. Han har deltagit i tre olympiader och är Finnjolleseglare precis som flera av oss 2.4a seglare. Vi bor på TanumStrand som har ett fint SPA med simhall. Vi hoppas att några norska vänner hittar dit trots att det i år kolliderar med segling i Norge. I snitt deltog 27 seglare på våra rankingar 2013 med 41 seglare anmälda till vårstarten i Ljungskile. Det finns en del att locka med. Inga gastar. All teknik, strategi och taktik får Du sköta själv. Rorsmans vikt verkar inta ha så stor betydelse. Se t.ex. Hasse och Peter ihop så förstår du detta. Du behöver inte kränga utan sitter skönt med ryggstöd. Konkurrensen är hård, och många båtar på startlinjen. Klassen på våra seglare är hög. Vid senaste VM i England med sjuttiofyra deltagare var fyra av de tio första svenskar och vi tog guldet. Vid vårt internationella SM 2013 i Gävle deltog 34 seglare. Henrik Johnsson och Håkan Kellner fick i uppdrag av International 2.4 Metre Class Association att resa till Charger Composites för att besikta de nya gjutformarna. Håkan och jag träffades på Arlanda för att ta flyget till Kokkola i Finland, under flygresan diskuterade vi upplägget inför mätningarna och vad vi i detalj skulle kontrollera samt vad som vi skulle fråga om. Ägaren av Charger Composites Evert Aartsen hämtade oss på flygplatsen för att köra oss till deras bostad där vi skulle bo under helgen. På kvällen blev det god mat och mycket prat om 2.4 segling och båtpolitik. En mycket trevlig kväll. Vi kom ner till båtbyggarlokalen på morgonen där Evert hade förberett allt som vi behövde inför mätningarna. Vår uppgift var att mäta en båt från gamla formen och en båt från nya formen för att se att dessa var lika. Efter nästan kompletta 2.4mR mätning och 2.4 Norlin One Design mätning kunde vi konstatera att det inte fanns några skillnader mellan formarna. Denna dag skulle vi göra ett spännande test, Engelska RYA (motsvarande Svenska SeglarFörbundet) har ett krav på att lyftöglorna ska hållfastighetstestas. Detta gjorde vi genom att spänna fast en båt på en lastpall med en massa 2.4 bly, för att sedan lyfta med kran. Vi lyfte till >360 kg i den ena lyftöglan och sedan provade vi den andra på samma sätt. Vi kunde konstatera att det inte blev några deformationer eller hördes några konstiga ljud från båten. Under denna helg intervjuade vi Evert om hur tillverkningen av våra fina båtar går till. Han svarade på alla frågor och visade oss hur montering av varje del går till samt vilka hjälpmedel dom använder.Till exempel berättade Evert att dom tar en bild med digitalkamera under durken för att kunna se att förstärkningen under mastfoten får kontakt med skrovet vid monteringen av durken. Efter detta besök på Charger Composites är jag imponerad över den ambition, kvalitet och noggrannhet som dom bygger våra 2.4or med och jag blev också glad över det intresse och förståelse som Evert visade för vår klass och våra klassregler. Tips inför en liknande resa. På Arlanda trodde man att våra vågar var farliga bomber och Håkans bladmått var farliga knivar, så vi lyckades med att nästan stoppa hela säkerhetskontrollen.